This new cereal appears to be an attempt by Post to grab some of the toddler snack market from General Mills' Cheerios cereals. 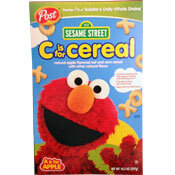 A head-to-head battle between Buzz Bee (Honey Nut Cheerios' mascot) and Sesame Street's Elmo (the character that appears on this new product). It's marketed directly toward toddlers and their parents and it's described on the package as "Ideal Food For Little Ones!" When I poured a bowl of this new cereal, I was struck by how light the cereal pieces are. It's almost as if they float from the box into the bowl. Holding a handful of the pieces feels like holding a handful of styrofoam. Unfortunately, eating this cereal as a dry snack also felt like eating styrofoam. As an adult, I did not like this cereal dry. I'd be anxious to hear what toddlers think about it as a snack. In milk, the pieces absorb a little liquid and become more dense giving them a mouth-feel similar to Cheerios. Now, we're left to critique the flavor. What flavor? The apple taste is so subtle - you could eat an entire bowl and not realize that it's supposed to be apple flavored. In my imagination, I picture that the cereal is flavored by a little guy with a spray bottle. 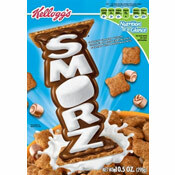 But for some reason, the guy is afraid of the cereal - so he approaches it, gives it a little spritz and then runs away. To this cereal's credit, it "contains nutrients that help support healthy brain development." Since I rarely imagine little people spraying vats of cereal with spritzer bottles, I have to assume this product did enhance my brain... or somehow messed it up, depending how you look at it. In the end, C Is For Cereal is B For Bad - at least from an adult perspective. Little kids sometimes like bland foods in small shapes, so the jury is still out on that one. Nutritional Considerations: Each 1 cup serving of Post's C Is For Cereal has 110 calories, 1.5 grams total fat (0 saturated and 0 trans), 0mg cholesterol, 125mg sodium, 21 grams total carbs, 2 grams dietary fiber, 1 gram sugar and 3 grams protein. What do you think of C Is For Cereal? I bought the banana flavored C is for Cereal, looking forward to the first time I've ever eaten banana flavored cereal. Well, I'm still looking forward to that time as this had ZERO flavor. It was like store-brand Cheerios but less flavorful, if that's possible. I agree with you. Don't buy this cereal unless you want to add a couple scoops of sugar and forget about eating it out of the box.